In preparation for the impending doom the coming of our empty nest, I spent the year of 2007 considering the idea of a puppy. Surely a puppy would fill the empty hours of the long, dull days that loomed ahead of me. I thought long and hard about the time and effort involved in the training of a puppy and whether or not I was up for the challenge. In early 2008, I decided that I was indeed up for it--after all, what else was I going to be doing?--and began my search. I thought a small dog would be best since, admittedly, I was going to take the pup everywhere with me. You know, in a Vera Bradley dog carrier (which, by the way, sits empty because he will have NO part of that whatsoever). Yes, I was going to be one of THOSE dog owners. 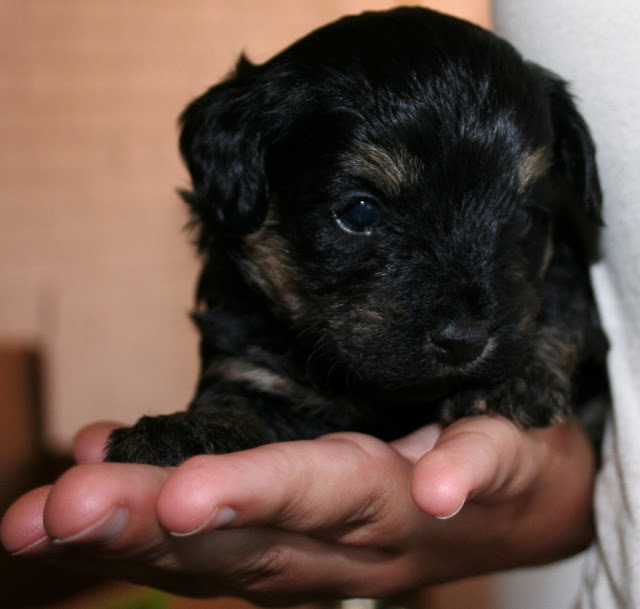 The search was on and, in no time at all, I found just the type of dog for me- a Yorkie Poo. I chose this breed not only because of their size and extreme level of cuteness, but also because they do not shed, and found a breeder in Spartanburg, SC (the website is www.scyorkiepoos.com and she is a wonderful person and breeder). Hubby, Birdie, DoodleBug and I went upstate to look at a puppy on Mother's Day and it was love at first sight for us all. After a grueling wait, we finally picked him up on June 10, 2008. I am not sure that I've ever seen a more spoiled dog in my life! I am often tempted to tell people who ask what kind of dog he is that he is a 'stinky poo' because of how spoiled he is. And, the thing is, hubby cannot put all the blame on me for the spoiling of the dog. After a few days of mulling it over, I settled on naming him Tucker. Of course he now responds to Tucky poo, Tucker Bug, puppy-wuppy woowoowoo, and the like. He will maul you when you come in the door and, by maul I mean climb all over you and lick you all over your face; he will high five you; when you say, "Tell me" he barks; when you point your finger at him and say, "bang, bang!" he rolls over and plays dead; he will dance for you and give you smoogees (kisses). But, when you say, "Come Tucker" he looks at you like you have lost your mind--after he sits down, of course. No matter. He is loyal and sweet and we just love him. Tucker and I enjoy combination bike rides/walks every single day of the week (because, once you start something like this with a dog, he WILL NOT let you skip a day EVER). He has a basket on the front of my bike that he sits in like royalty, enjoying the bike rides while I pedal and sweat. After we bike a few miles we walk a mile or two so that Tucker can enjoy marking every single bush and tree we pass. Now, I realize that a dog is not a replacement for a child. But this dog has really filled our hearts- including our daughters' hearts. And the empty nest is not quite as empty as it would have been without him. This is Day 6 of NaBloPoMo for the month of March. The theme this month is: "In a Word." No prompt or word given today so my word choice is, Tucker. That is one cute looking little dog. Do you want to swap him for Naughty George by any chance? Sweet ball of fur and handsome grown up! Tucker is very cute! He certainly is your furkid! Pets do help fill our lives, that's for sure. I think it was a good idea to get a dog. Anni- Isn't he just the cutest?! The love of my life! I love the name Irene- I just think it's pretty. Karen- It's been the best idea I've ever had! Marnie- They do such a grand job of filling our lives with such joy, don't they?! That first picture is an keeper. OMG I'd frame that. So adorable. Barb- We have almost as many framed of him as we do of the girls! LOL Thanks! Can I come play with Tucker? Alternatively, send him over to play with our Pablo! Corinne- Tucky LOVES to play! Especially with other doggies! Susie-Thanks! Tucker was almost a Max! He says hello back! What absolutely super cute photos of that little puppy of yours! He's gorgeous, and I can just picture him sitting in that basket whilst you pedal away furiously!! Tucker poo must be such good company for you now that the girls are away. Just imagine how quiet it would be without him! Hope you've had a good weekend. Tucker is adorable. We rescued a dog at Christmas time this year and she has quickly climbed into all our hearts. Already we can't imagine life without her around. Tucker, the Tuckster, Tuckman, Tuckalicious...give Tucker a rub on his head and tell him I said hello. I love Tucker. Really I haven't met a dog I haven't loved. Wilbur is my love now, before that Tuna, before her, Porky, before him Pigglett, before him Bear, before her Scamp. There is no other love then a dogs love when you come home being it one minute cuz you forgot something or 2 hours cuz you were shopping. This-thank you! We have so much fun with him! He is spoiled ROTTEN! Julia- It really doesn't take long at all does it? Julie- I'm the same way! They are just the greatest! He's soooo cute! I know a dog cannot replace your child, but it fills your life tremendously. We don't have kids with two legs, but plenty of those with four legs. Tucker is the most adorable little dog. It is unconditional love. We have a Westie, and we love him to death. Alessandra- They really do fill our lives, don't they? A woman who walks her golden retrievers told me she doesn't have children but her dogs are really just like kids! Susan-Thanks! They are simply the best, aren't they?! For some reason I did not realize Tucker is a Yorkipoo! He is just adorable and I love the picture un the birdbath! If I did not have my fur babies, the house would be very lonely! He's lovely. I also love the quote about dogs counting. Shawn-That was the first day we had the birdbath and he insisted on getting in. When we put him up there he laid right down in the water but had gotten up by the time I got my camera! The pictures are adorable. He is so cute. What a cutie!! No, dogs are no replacement for a child - but they're lots easier to train!! OMG!! How cute are those pictures!!!! I love that tucker exercises with you! Well at the very least roots for you in the basket on your bike. You have to get a picture of that one!